As seen on RAW tonight, Ronda Rousey did not appear on the show, despite WWE announcing last week that Rousey would appear on every RAW until WrestleMania. "Raw is about to get a lot more Rowdy!" the WWE statement read last Monday. 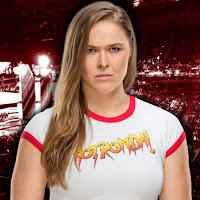 "It has been announced that Ronda Rousey will appear on every single episode of Raw leading up to WrestleMania... What impact will Rousey have on the Road to WrestleMania? Tune in to Raw every week to find out!" WWE has since updated their advertising and removed Rousey from the next two RAWs, as well as deleting their original article about Rousey's RAW appearances. Rousey is now slated to appear at one RAW before WrestleMania, the April 2nd show from the Philips Arena in Atlanta, Georgia. No reason has been given for the change in Rousey's schedule, although it could always be to give her more time to prepare for the match. As noted, Rousey is scheduled to appear on Ellen this week, although she will be appearing on Tuesday and not Wednesday as we originally reported.